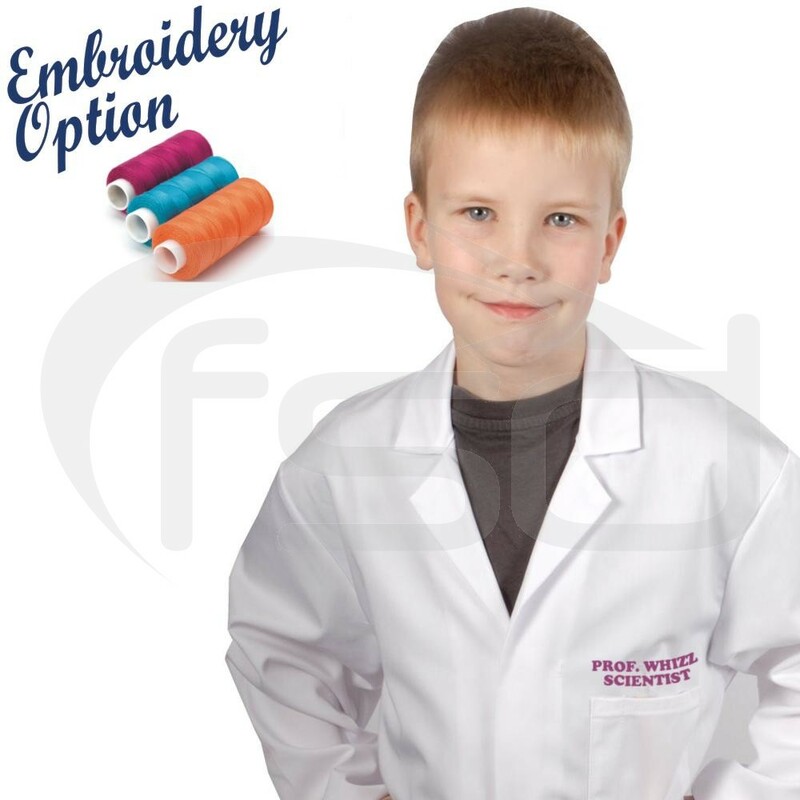 Kid's lab coats in white, offered in a range of sizes, embroidered with your child's name, school or team name or logo. Available on-line for UK customers only. Please contact us for overseas orders. Colours shown are representative. The actual shade may vary slightly. Please let us know if we have supplied you with embroidery previously, as this will help us to process your order quicker and ensure design consistency. Please allow up to 5 working days for delivery of embroidered products. When choosing a text colour select a colour that contrasts with the garment. Dark colours show best on light coloured clothing and vice versa! Maximum of 18 characters per line allowed. Spaces count as a character. Avoid long lines of text as these will be small when embroidered and therefore harder to read. Take care when you type! We embroider the text as you input it. We do not check for spelling mistakes and remember to use capital letters where appropriate. We also offer Logo Embroidery and Custom Lab, Food Trade and Warehouse Coats. Please enquire for a price. All embroidery orders are subject to our terms and conditions. For more information regards embroidery orders, including specific terms and conditions, please take a look at our Embroidery page. No more rolled up sleeves or hems touching the floor. These kids lab coats are exclusive to Food Safety Direct and have been designed especially for children! Our kid's lab coats are made from top quality poly-cotton to the same standard as our adult coats. They feature a rear vent and 3 patch pockets, the breast pocket incorporates a pen slot. The age ranges shown below are for guidance only. We strongly recommend that you measure your child and use this guide to select the most appropriate garment option.